We spent last weekend in Woodhall Spa, Lincolnshire visiting Anne's mum and step dad. On the Saturday evening we even got to go to the cinema to see Slumdog Millionaire (the night before it won all those Oscars). We saw it at the Kinema in the Woods cinema in Woodhall Spa, an old historic cinema which still has an intermission in its films. As the curtain came down, a man playing an organ came up through the stage floor and entertained the crowd with old fasioned organ music. It's a bizarre thing to see during a film. We've been there before but it's not something you get used to. Here's a You Tube vid (not mine) of what I'm talking about. 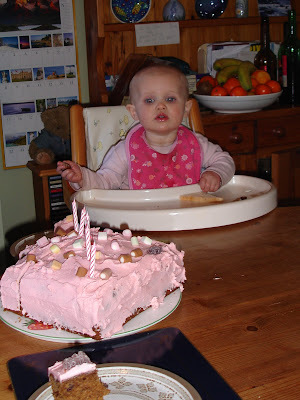 While we were at 'Granny Watkins's house' we had a samll celebration of ThingTwo's first birthday (which is tomorrow). ThingTwo enjoyed her cake (dairy free and egg free thanks to our kids' allergies), and her Benjamin Bunny soft toy. 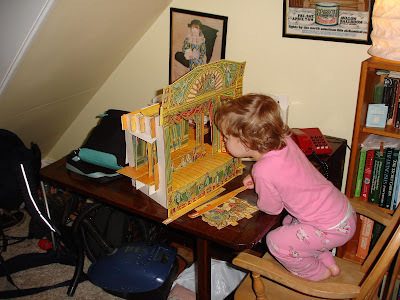 I showed ThingOne Disney's Cinderella on DVD, and coincidentally she also got a late birthday present of an old fashioned cardboard theatre featuring the story of Cinderella. She took to this surprisingly well, and played by herself for ages (presumably wondering where the singing mice were). 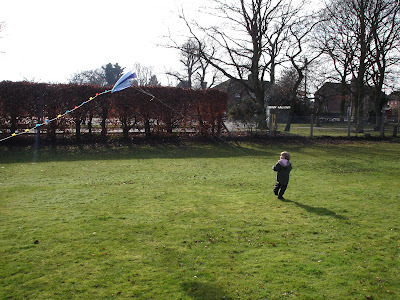 Most impresssively (to me) ThingOne and I got to fly a kite together, even though there wasn't much wind. Here's a shot of ThingOne the kite runner. She was impressed for a short while, and then decided she was going to dance on 'the stage' (some tarmac) and the boys (me) weren't allowed on the stage. They needed to run around with the kite. So essentially it ended up as ten minutes of her doing a weird little jig at the edge of a field while I ran around with the kite. Whenever I stopped (exhausted) ThingOne would shout at me to keep running, and then carry on dancing. SHouldn't she be doing the running? She's got youth on her side.